Introduction: Though gastrointestinal (GI) bleeding is rare in patients with HIV infection, it has been an important cause of mortality and morbidity in these patients. The course of human immunodeficiency virus (HIV) disease has changed dramatically since the development of antiretroviral therapy in the mid 1990s. There is a significant change in the pattern of opportunistic infections and malignancies in HIV patients. But there are no recent large studies in the literature (last study was 10 yrs ago) evaluating the current incidence and etiology of GI bleeding in HIV infected patients. Methods: All HIV infected patients who had GI bleeding (both upper and lower GI bleeding) during the hospital stay at Bronx Lebanon Hospital Center from January 2003 to September 2008 were identified and studied. Results: There were total of 11409 HIVpatients admitted during the study period. 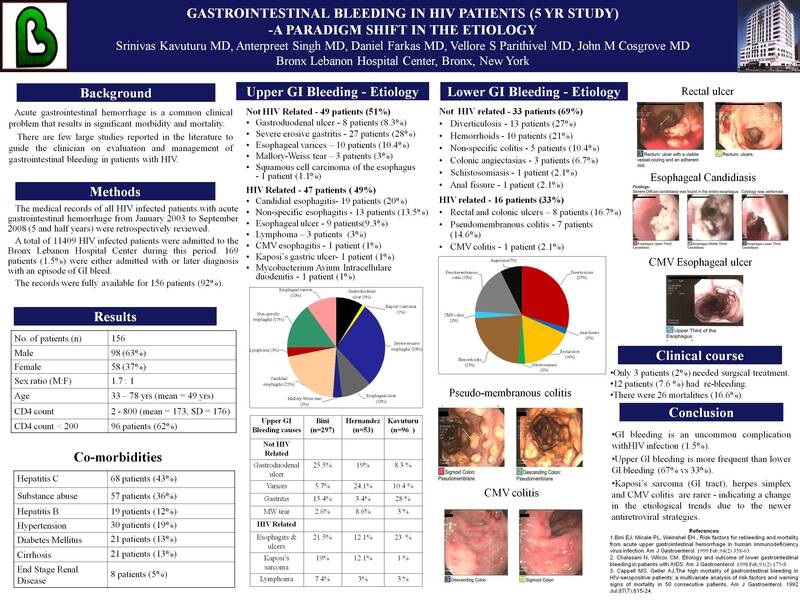 Among them 144 patients (1.26%) presented with GI bleeding. 96 patients had upper GI bleeding and 46 had Lower GI bleeding. Candidial esophagitis (16.7%), Non-specific esophagitis (12.5%), Esophageal ulcer (8.3%) were the three most common HIV-related causes of the upper GI bleeding. Rectal ulcers (16.7%) and psuedomembranous colitis (14.6%) were the two most common HIV-related causes of lower GI bleeding. Only one case of Kaposi’s sarcoma, two cases of Cytomegalovirus (CMV) related bleeding and two cases of GI lymphoma were encountered. 12 patients (7.6%) had rebleeding and 26 patients (16.6%) died during the episode of GI bleed. Neither the CD4 count nor the platelet count were significantly correlating with the rebleed. Mortality associated with bleeding was 16%. Earlier studies quoted incidenc of kaposi’s sarcoma and lymphomaas the cause of GI bleeding as high as 30% which is not seen in our study. Conclusion: GI bleeding is an uncommon complication with HIV infection (1.5%). Upper GI bleeding is more frequent than lower GI bleeding (67% vs 33%). Kaposi’s sarcoma (GI tract), herpes simplex, CMV colitis are rarer- indicating a paradigm shift in the etiology due to the newer antiretroviral strategies. Prompt resuscitation and diagnosis of a potentially treatable cause of bleeding in HIV patients improves survival which otherwise is associated with a significant mortality (16%).